Warning: I’m going to nerd out on plants again. As I briefly discussed in class last night, one of the articles from my annotated bibliography discussed the meanings of plants in Mrs. Dalloway. In her article, “Nature as Symbol and Influence: The Role of Plants in Mrs. Dalloway,” Jeanne Shearer explains a bit of history about plant symbolism. I am just going to throw in a few fun facts here from Shearer’s article because they are fascinating, and then I will talk about Mrs. Dalloway, I promise. 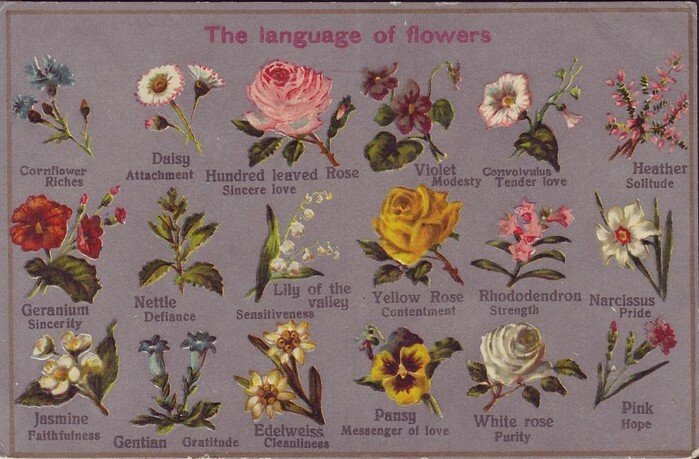 Fun fact 1: “In nineteenth-century Europe, flower symbolism appeared in the popular flower language…[which] consisted of certain flowers representing specific words or phrases; combinations of significant flowers could thus spell out whole sentences” (Shearer 26). Isn’t that cool? I wish we still spoke in flower language. Fun fact 2: “Several Greek myths deal with the origin of certain flowers, many of which are described as having come from the blood or tears of certain gods and goddesses” (Shearer 26). Anyway, back to Mrs. Dalloway. Since there is SO much plant symbolism in the novel I am going to stick to the scene that Richard gives Clarissa red and white roses and does not say what he is feeling. Shearer claims that roses in general “symbolize love and beauty” and that red and white roses “are a symbol of unity” (26). Since Clarissa is having issues with her identity and searching for herself, Shearer claims that the white and red roses signify a unity with Richard because she identifies as his wife, as Mrs. Dalloway (26). However, I looked into this a little bit more and found some other interesting factors that could contribute to our reading of the flowers. According to the article, “Flower Meanings: Language of Flowers,” in The Old Farmer’s Almanac, white roses symbolize purity, innocence, reverence, and silence, whereas red roses symbolize love and desire (just for kicks and for the sake of this blog post, let’s pretend the white roses are a symbol for Clarissa, and the red roses are a symbol for Richard). The two words I found most compelling in these descriptions are “reverence” and “silence.” If we apply these words to how we read Clarissa, I think we can learn something about her internal struggles. Because we know that Clarissa is having somewhat of an identity crisis, I think the symbolism of “reverence” in the white roses could refer to her reflecting on her past, when she enjoyed life and was proud of who she was. She is searching for her identity but she is tied to Richard and has lost her independence, which brings me to the next word: silence. If Clarissa has lost her identity and is now defined by her husband, then “silence” becomes problematic. Although it may be a stretch, I think the white roses could symbolize Clarissa’s silence and her conversion into thinking she know nothing. This could be another way Woolf is depicting male dominance over females in the novel. Before Clarissa was married, she read Plato before breakfast and seemed to be a free-spirit; however, after her marriage, she has been silenced and does not express her opinions or engage in educated conversations. Instead, Clarissa is left worrying about domestic duties, such as throwing a party and entertaining people. Shifting to Richard (whom I do not have as much to say about), I think the red roses symbolize him because he cannot say what he is thinking. 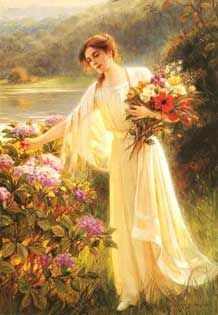 Richard wants to tell Clarissa that he loves her, but he does not use words, he only gives her the flowers. If the flower language that I mentioned at the beginning of this post is still relevant, than maybe he got the idea across. However, let’s assume flower language isn’t common knowledge. Giving someone roses, especially red roses, is pretty cliche. Sure, it is a nice gesture and shows that you were thinking about someone, but it isn’t very original. Flowers are nice, but I think they are a default when you want someone to know (or think) you like them. Richard is hoping that Clarissa understands that he is trying to say “I love you,” but is he really? Or is he telling Clarissa that she needs to remain silent (with the use of the white roses) and that he will appear to love her (with the use of the red roses)? Just a random thought. Note: I have not found consistent meanings on all of the flowers. I am just going along with the article in the Farmer’s Almanac, like I said before.